Raccoon Traps - Which One Should You Use? Raccoon traps are available in many different shapes and sizes, so which ones should you buy? Here's the good news.......constructing a set for a raccoon is pretty easy. Since raccoons are rarely trap shy there are a lot of different sets that work really well for catching a raccoon. If you're thinking about trapping a raccoon for the first time or you're simply replacing some of your old, rusty, worn out traps, deciding which size or style of trap to buy is always difficult. Since many of us will start out trapping raccoons near water, choosing a trap that will catch a muskrat or a mink should also be considered. Using a trap that's too large may cause you to miss out on that occasional mink that travels by your set. A trap or equipment that's too small could lead to a pull out or lost trap. To make things easier we've created a guide for choosing the best size and style traps to use when targeting raccoons in a variety of different scenarios. Using a foothold trap near a river, stream or ditch bank is a great way to catch a raccoon. 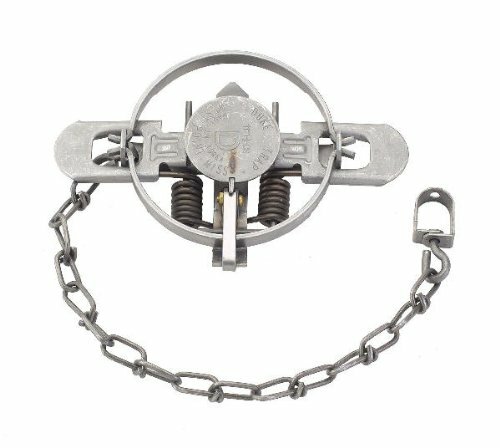 Although there are many different sizes and styles to choose from, the #1.5 coil spring trap is in my opinion the best choice. The #1.5 coil spring offers tremendous speed and power while still being compact and easy to set. It's small enough to effectively trap a mink or muskrat but large enough to easily hold a raccoon. It's important to understand that a raccoon trapped in a foothold will relentlessly fight the trap. To prevent loosing the trap (which has happened to almost everyone at some point including myself) securely fasten the trap using cable or 11 gauge trapping wire. Although many people use 14 gauge (which is thinner than 11 gauge) for mink and muskrat it's not strong enough to hold a raccoon. As the raccoon fights against the foothold it can kink the wire forming a weak spot. Bending the wire back and forth at the kink will cause the wire to break. An example would be bending a coat hanger back and fourth with your hands at a fixed point. Even though the wire is thick you can easily break the hanger. So, when trapping raccoons the 11 gauge wire or cable will drastically reduce the possibility of loosing your trap. Anchor the trap using a drowning wire setup if you have water deep enough or securely stake it. The trap should also contain 2 swivels which will allow the trap to rotate freely and reduce the amount of stress on the raccoon. Remember, if you can allow a raccoon to remain calm and comfortable, it's less likely to fight the trap. Conibear traps also work really good on raccoons. Since these traps are kill traps caution should be used when you're trapping in an area where cats and dogs are present. Also many states have specific laws that prevent setting large conibear traps on dry land. Before using these traps, check your local regulations to make sure they're legal. The #160 and #220 are both very good raccoon traps. Placed in a bucket set, trail set or in front of a cubby will produce a lot of raccoons. When constructing a trail set, look for a well worn path the raccoons are using as they navigate towards a water source or food source through the grass and thick vegetation. Place the conibear an inch or two off the ground and securely stake the trap making sure it doesn't rock back and fourth. Adjusting the trigger so it's positioned off to one side of the trap as opposed to right in the middle will reduce the possibility of catching rabbits while still making it effective for raccoons. Stay away from the #110 conibear which works well for mink and muskrat but they're just too small to effectively hold a raccoon. Also, stay away from the #330 conibear which are very popular for beaver but too large for a raccoon. Dog proof raccoon traps have become very popular because they work great for trapping raccoons and it reduces the risk of catching a dog. The possibility of catching a cat or other non targeted species still exists but the odds are much less when compared to a foothold. The traps have a trigger system that requires the raccoon to reach down into the cylinder towards the back of the trap. Place a cotton ball soaked with a lure or a bait of your choice in the back of the trap. If you're near a barn or other area where cats are around, try using a marshmallow with a vanilla scented lure. Cats do not seem to be attracted to this like they are when using a fish oil formula. The trap only activates when the trigger is pulled from the trap not pushed, so it's important to place the bait or attractant in the back of the trap. As the raccoon reaches in and grabs the bait, it will spring the trap as it removes its hand from the cylinder catching its hand in the trap. A setting tool makes the trap easy to set. A metal post on the back of the trap allows you to stick it into the ground on an angle. 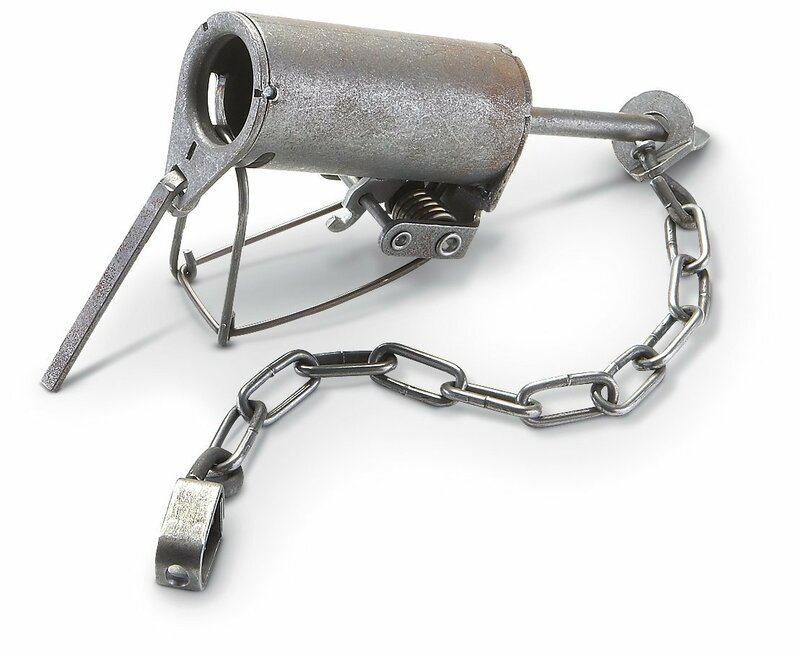 The trap chain is also equipped with a swivel which makes them easy to attach to a nearby stake. Dog proof raccoon traps are quick and easy to set and they work really well! The only real disadvantage of using a dog proof trap when compared to a foothold is the reduced possibility of catching a mink or muskrat which are common when using footholds. If you're thinking about purchasing some raccoon traps consider buying a #1.5 coil spring, #160 or #220 conibear, or a dog proof trap. When used correctly these traps work great and they're sure to add a lot of success to your trapline.